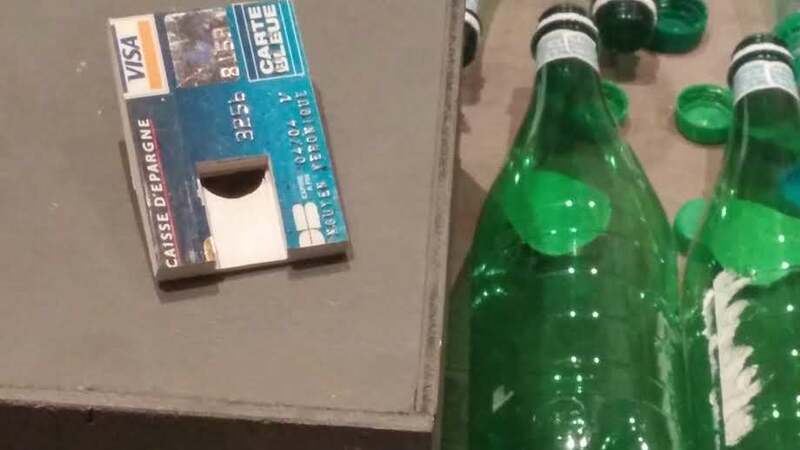 Ever thought of using your outdated bank card to create a flute that can imitate birdsongs? 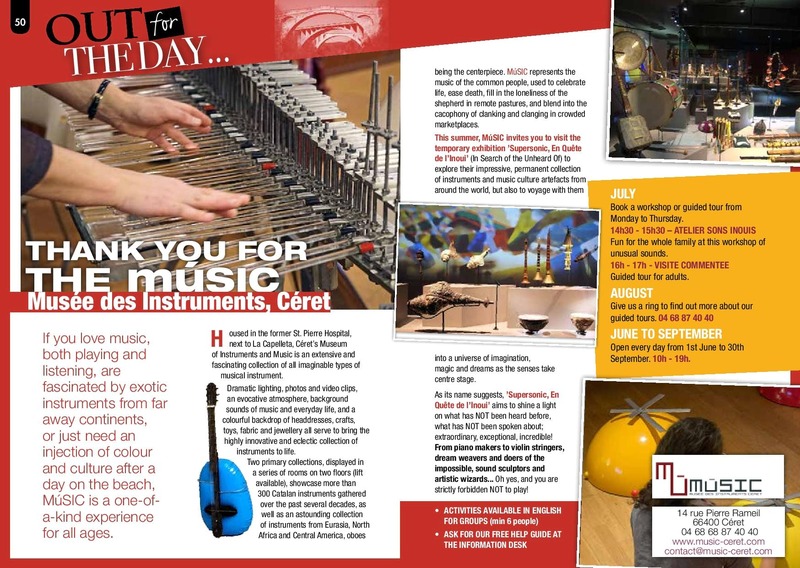 At MuSIC Musee des Instruments in Ceret, you can get a close look at just such an instrument created by Amazonian Indians. Alongside it are instruments created with recycled tin cans and plastic bottles. They’re all part of MuSIC’s current exhibit called Supersonic. To set the scene on the ground floor, items such as a circle of flat stones and bamboo sticks, dried gourds, and bones have been added to the permanent exhibition to remind visitors that humans have been creatively using objects in their environment for thousands of years to make music. 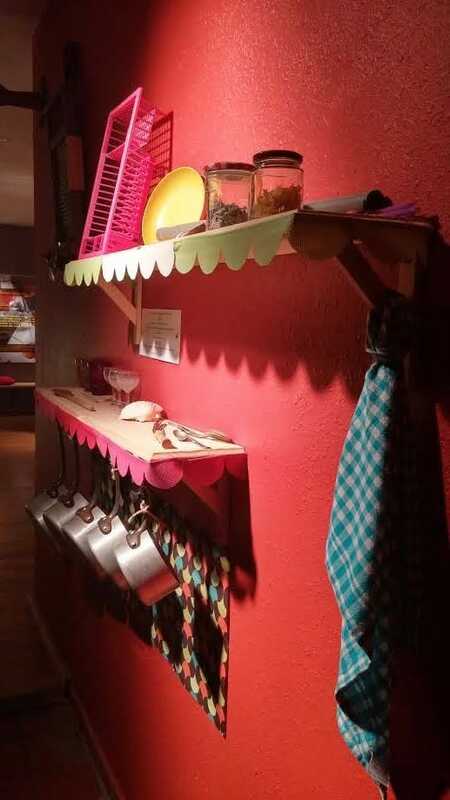 The exhibition continues up on the first floor, where a shelf has been installed on one wall containing typical kitchen items such as pots and pans, wooden spoons, and a washboard. Signage references how plantation slaves used these ordinary objects to make music. Visitors are encouraged to do the same and then post their musical creation videos to Facebook or Instagram, using museum hashtags. The first floor also includes a room containing one-of-a-kind contemporary musical instruments such as an electroacoustic lyre. Each instrument is designed using traditional materials such as wood in combination with more contemporary metallic components. And each is numbered, enabling visitors to view a screen where the instrument’s number and a photo appear in sequence along with a recording of the instrument’s sound. Hmmm. If this eclectic collection exists now, wonder what other sorts of mind-expanding musical instruments may be percolating in the pipeline? The second floor is an especially inviting space for families with children because reservations can be made to play the instruments housed there. On the right side of the room is a collection of gamelon instruments, the traditional ensemble music of Java and Bali. On the left side, a unique “instrumentarium” consisting of “sound structures” designed by the innovative French Baschet brothers awaits. 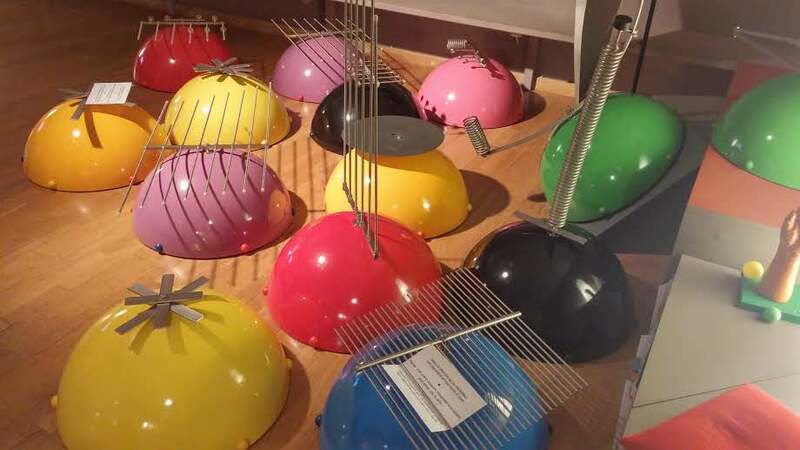 Their collection consists of metal bars mounted atop colourful half-cones that amplify the sounds created by “playing” the bars. In the centre of the family room is an imposing “sound sculpture,” a 3-metre tall gleaming piece of folded sheet metal that is a sculpture in its own right. But it also musically comes to life when a person runs their fingers along the metal and sings into the sculpture’s folds, amplifying and transforming their voice. Perhaps the most quirky and intriguing parts of the exhibition are the last two rooms, located back down on the ground floor of the museum. The first room contains a “deliriophone,” a large organ-like instrument that is musically linked to a wall-sized screen behind it that continuously shows a video of a steam-belching calliope. Visitors are encouraged to try their hand at the organ. When someone plays a note on the keyboard, an image of a random instrument pops onto the screen and its sound is broadcast in addition to the keyboard note. Located just above the keyboard are a set of dials that can be twisted to modify the sound. It’s an exercise in musical fun if not logic. Rounding off the exhibit, in the last room, more than a dozen single headphones tantalizingly dangle down, intentionally within reach, from the ceiling. By pushing a button on the side wall and then putting a series of headphones to your ear, you can hear an excerpt of Mozart’s “Magic Flute.” Each headphone offers up a different spin on the same music – operatic, jazz, something contemporary akin to rap, and even a version for your dentist’s office. 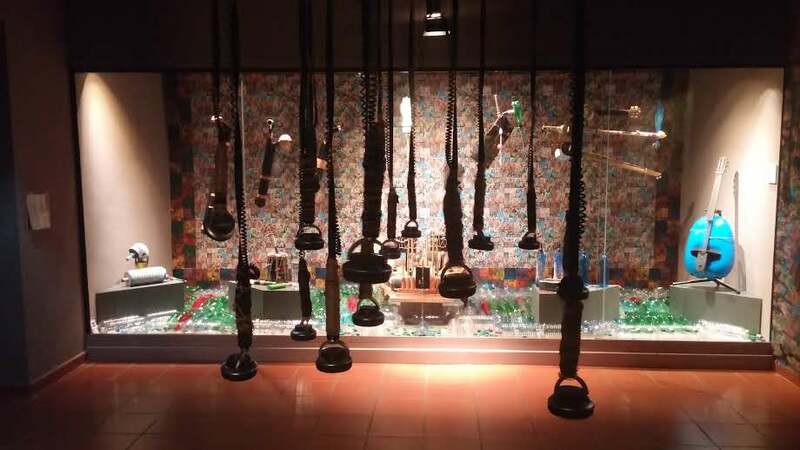 Here, as elsewhere in the exhibit, the message seems to be that music and the culture in which it is created or adapted are inextricably linked. 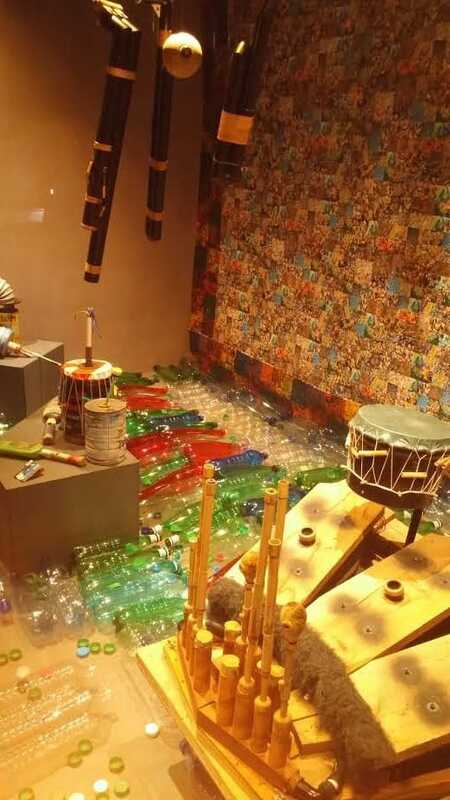 Finally, along one side of the room, a large glass case provides a hopeful snapshot of how humans’ desire to make music is contributing to recycling a miniscule portion of the mounting mountains of discarded plastic all around us. To set the stage, the floor of the case is filled with plastic bottles. And on display above them are an eye-popping collection of “artisan” musical instruments collected from around the world, each of which is at least partially fashioned from a plastic bottle, metal can, or other consumer container. An empty shampoo bottle has become a “punch flute” in which the air in the bottle functions as a bellows. When you squeeze the bottle, the air is forced out through the top wooden portion of the flute and creates a musical sound. A discarded tin has become transformed into the body of a ukulele. And then there’s that bank card that now has a second life as a nose flute. Have you decided yet to make one yourself? Supersonic will run until June of 2019. Admission to the museum, which includes both the current and permanent exhibits, is 7 euros for adults, 5 for students, and gratis for children under 7. The museum is open every day from 10 a.m. to 7 p.m. through September. From October through May, it is open Tuesday to Saturday from 10 a.m. to 5:30 p.m. It is located at 14 Rue Pierre Rameil in Ceret. Tours of the current exhibit in English are available by reservation for ten or more people. A guide in English is available at the desk lobby. For more information, telephone 0468 87 4040.